The fall season shows all of our teams looking strong! It’s exciting to be a Milford Eagle! Football is off to a 2-1 great start (3-1 as of last night!) including a home victory on the new turf in triple overtime against Edgewood! Dedication of the new field took place at halftime with a huge thank you to the Athletic Boosters and their community partners for their efforts. Congratulations go out to Drew Ashcraft for being named the Ohio National Guard Football Player of the Week for his performance! The Eagle’s are gearing up to take on Woodward tomorrow, at home, at 7:30 pm. Highlighting one of our other outstanding teams, girls’ golf is ranked 1st in the ECC and is undefeated at 14-0! Junior Megan Creager is the ECC leader averaging 38.9 and Milford holds the top 3 averages for the entire league. Way to go, Eagles! It’s hard to believe, but I’ve been writing this school board blog for four years now. I started it in September, 2009 as I began my campaign for school board, and I’ve posted about the district virtually every month since. I have chosen to seek a school board seat again for the next four-year term. I feel we have achieved a tremendous amount in this current term, and I’d like to help address some of the challenges and opportunities we will be facing. I’ve chosen to run a joint campaign with Gary Knepp, who served on the school board from 2008-2011. He left the board for two years as he finished writing a couple books, but would now like to return also because of what will be happening in the next few years. Gary and I have also partnered with David Yockey, who has been a school board member for 12 years now. Dave, Gary and I have developed a respectful, supportive relationship, with each of us bringing different skills, knowledge and perspective to the table. The Knepp/Brady campaign website can be found here. On it, you can see Gary’s and my backgrounds & accomplishments, the challenges we believe we are facing, and our blog. Dave’s website can be found here. I will not use this site as a campaign site, other than this article to introduce my campaign and a few guest blogger articles over the next five weeks. If you have any questions, please feel free to get in touch. I ask for your support for Brady, Knepp & Yockey on November 5! SMART goals are annual stretch goals: if achieved, they would take the district to a significantly higher level. This year’s SMART goals are below. Dr. Farrell and the administrative staff believe these are achievable based on specific opportunity areas they have been able to identify. This year’s goals will also be helped by the additional pre-testing all districts are doing to be able to evaluate if they are meeting state student achievement requirements. The testing will help us determine precisely where each student is at the beginning of the year, allowing teachers to focus on individual needs to achieve more than a year’s growth over the school year. The district will improve achievement for all students by the end of the 2013-2014 school year. We will target the goal of exceeding more than a year’s growth in student achievement in a year’s time for every student.We will improve student achievement by:* Implementing pedagogy to meet the new learning standards and implement the aligned local curricula. * Our Performance Index for the state assessments will improve to 107. * All of our students in all groups will meet Annual Measurable Objectives as determined by the state of Ohio. * Students in grades k-8 taking MAP and Pro-Core assessments will demonstrate more than a year’s growth in achievement in a year’s time. * Students in grades 9-12 taking the ACT suite of tests that include the “Explore,” Plan” and “ACT” will demonstrate more than a year’s growth in a year’s time. * Maintain current high numbers of students enrolled in Advanced Placement classes and increase passage rate to 76%. The district will increase writing opportunities for all students to align with new local curricula across the curriculum by the end of the 2013-2014 school year. * 100% of k-5 students will meet grade level standards in reading and writing through the Ready Gen program. * 100% of grades 6-12 students will score at the proficient level on the district-created rubric for expository and argumentative writing, focusing specifically on ELA and social studies. * 100% of students in grades 6-12 will write an expository or argumentative essay in science that will be scored using the district rubric. 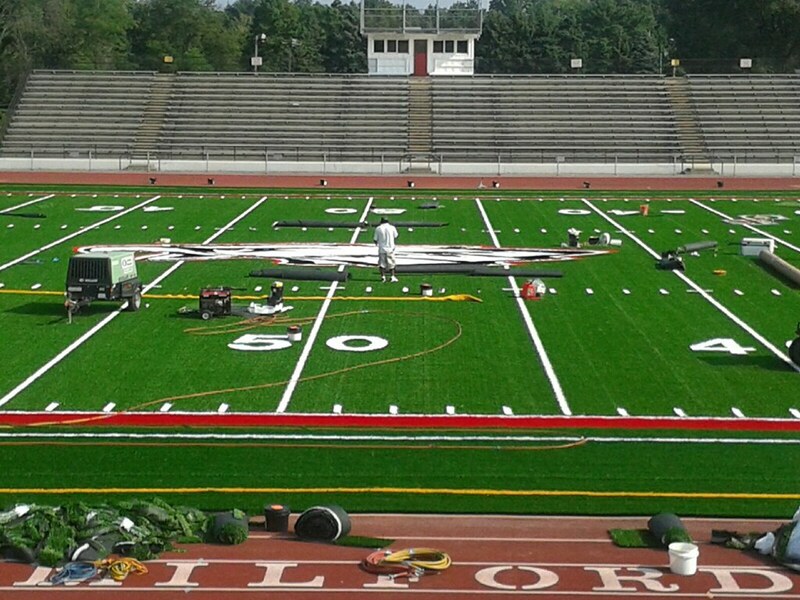 On Friday, September 6, 2013, the Milford Athletic Boosters (MAB) and Milford Schools christened the new artificial turf football field at halftime of the first varsity game of the season. After a game that the Milford Eagles won in triple overtime, students stormed the field to celebrate the win and the turf with the team. “It was a heck of a way to christen the new field,” laughed Dave Meranda, President of the MAB, at the September 19 school board meeting.